The eighth and final season of the fantasy drama television series Game of Thrones, produced by HBO, is scheduled to premiere on April 14, 2019. Filming officially began on October 23, 2017, and concluded in July 2018. Unlike the first six seasons that each had ten episodes and the seventh that had seven episodes, the eighth season will have only six episodes. Like the previous season, it will largely consist of original content not found in George R. R. Martin's A Song of Ice and Fire series, and will also adapt material Martin has revealed to showrunners about the upcoming novels in the series, The Winds of Winter and A Dream of Spring. The season was adapted for television by David Benioff and D. B. Weiss. 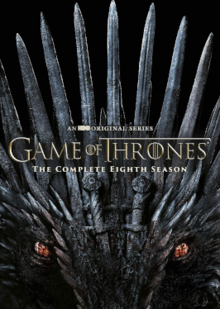 Unlike the first six seasons that each had ten episodes and the seventh that had seven episodes, the eighth season will have only six episodes. Like the previous season, it will largely consist of original content not found in George R. R. Martin's A Song of Ice and Fire series, and will also adapt material Martin has revealed to showrunners about the upcoming novels in the series, The Winds of Winter and A Dream of Spring. The season was adapted for television by David Benioff and D. B. Weiss. The eighth and final season of the fantasy drama television series Game of Thrones was announced by HBO in July 2016. Like the previous season, it will largely consist of original content not found currently in George R. R. Martin's A Song of Ice and Fire series; it will instead adapt material Martin has revealed to showrunners about the upcoming novels in the series, The Winds of Winter and A Dream of Spring. Series creators and executive producers David Benioff and D. B. Weiss will serve as showrunners for the eighth season. The directors for the eighth season were announced in September 2017. Miguel Sapochnik, who previously directed "The Gift" and "Hardhome" on season 5, as well as "Battle of the Bastards" and "The Winds of Winter" on season 6 will return as director. He will divide up direction of the first five episodes with David Nutter, who had directed two episodes on seasons two, three and five, including "The Rains of Castamere" and "Mother's Mercy". The final episode of the series will be directed by Benioff and Weiss, who have previously directed one episode each. At the series' South by Southwest panel on March 12, 2017, Benioff and Weiss announced the writers for the series to be Dave Hill (episode 1) and Bryan Cogman (episode 2). The showrunners will then divide up the screenplay for the remaining four episodes amongst themselves. In an interview with Entertainment Weekly, HBO programming president Casey Bloys stated that instead of the series finale being a feature film, the final season would be "six one-hour movies" on television. He continued, "The show has proven that TV is every bit as impressive and in many cases more so, than film. What they're doing is monumental." Filming officially began on October 23, 2017, and concluded in July 2018. Co-creators David Benioff and D. B. Weiss have said that the seventh and eighth season would likely consist of fewer episodes, stating that after season six, they were "down to our final 13 episodes after this season. We're heading into the final lap". Benioff and Weiss stated that they were unable to produce 10 episodes in the series' usual 12 to 14-month time frame, as Weiss said, "It's crossing out of a television schedule into more of a mid-range movie schedule." HBO confirmed in July 2016, that the seventh season would consist of seven episodes, and would premiere later than usual in mid-2017 because of the later filming schedule. Benioff and Weiss later confirmed that the eighth season will consist of six episodes, and is expected to premiere later than usual for the same reason. Benioff and Weiss spoke about the end of the series, saying, "From the beginning we've wanted to tell a 70-hour movie. It will turn out to be a 73-hour movie, but it's stayed relatively the same of having the beginning, middle and now we're coming to the end. It would have been really tough if we lost any core cast members along the way, I'm very happy we've kept everyone and we get to finish it the way we want to." Ramin Djawadi is set to return as the composer of the series for the eighth season. The season is scheduled to premiere on April 14, 2019. On December 6, 2018, HBO released the first official teaser trailer for the eighth season. A second teaser trailer was released on January 13, 2019, which announced the premiere date as April 14, 2019. The trailer was directed by David Nutter. HBO released a promotional advertisement with Budweiser on February 3, 2019, during Super Bowl LIII. Later, it was released first-look photos of several main characters on February 6, 2019. 1 2 Hooton, Christopher (September 27, 2017). "Game of Thrones season 8: Directors revealed for all episodes". The Independent. Archived from the original on October 20, 2017. Retrieved October 20, 2017. ↑ "Shows A-Z - game of thrones on hbo". The Futon Critic. Retrieved January 15, 2019. 1 2 3 4 5 Goldberg, Lesley (June 21, 2016). "'Game of Thrones' Stars Score Hefty Pay Raises for Season 8". The Hollywood Reporter. Archived from the original on August 22, 2017. Retrieved August 28, 2017. ↑ "Liam Cunningham (Davos) talks about the filming schedule for Game of Thrones Season 8". Winteriscoming.net. January 10, 2017. Archived from the original on August 28, 2017. Retrieved December 18, 2017. ↑ Thompson, Avery (February 15, 2017). "Sophie Turner Drops Massive Spoiler About Sansa Stark's Fate in Season 8". Hollywood Life. Archived from the original on October 2, 2017. Retrieved December 18, 2017. ↑ Morton, Ashley (August 28, 2017). "Maisie Williams Thinks Arya Went Hunting for Trouble This Season". Making Off Game of Thrones. Archived from the original on September 16, 2017. Retrieved December 18, 2017. 1 2 Perry, Spencer (October 6, 2017). "Game of Thrones Season 8 Filming Will Continue Up Until Summer 2018". SuperHeroHype. Archived from the original on January 25, 2018. Retrieved January 25, 2018. 1 2 3 4 Shepherd, Jack (October 24, 2017). "Game of Thrones season 8 filming looks to be underway as cast members spotted in Belfast". The Independent. Archived from the original on October 24, 2017. Retrieved December 18, 2017. ↑ Bradley, John (August 29, 2017). "There's a new tag team in town. 💪 Hope you enjoyed season 7. Thanks for watching and we'll be back. The wait starts now. 😊 #gameofthrones #GOT". Instagram. Archived from the original on March 22, 2018. Retrieved December 18, 2017. ↑ Bradley, Bill (August 30, 2017). "'Game of Thrones' Actor Says Cut Scene Would've Explained Confusing Finale Moment". HuffPost. Archived from the original on December 22, 2017. Retrieved December 18, 2017. ↑ Bradley, Bill (August 28, 2017). "'Game of Thrones' Actor Rory McCann Says He's Already Training For Cleganebowl". HuffPost. Archived from the original on March 22, 2018. Retrieved December 18, 2017. ↑ Kinkaid, Ben (January 5, 2018). "What News From Westeros? Everything we know about Game of Thrones Season 8". GQ. Archived from the original on March 25, 2018. Retrieved March 25, 2018. ↑ Stolworthy, Jacob (January 17, 2018). "Game of Thrones season 8: Melisandre return confirmed as fans theorise on character storyline". The Independent. Archived from the original on January 26, 2018. Retrieved January 25, 2018. 1 2 3 4 Bundel, Ani (February 20, 2019). "The Night King May Not Be In The 'Game Of Thrones' Season 8 Premiere, Here's What That Means". Elite Daily. Retrieved February 21, 2019. ↑ Warner, Sam (June 8, 2018). "Game of Thrones' Hannah Murray warns that the show isn't getting a "fairytale happy ending"". Digital Spy. Retrieved February 20, 2019. ↑ Warner, Sam (February 23, 2018). "Game of Thrones fans can tour key locations and go "beyond the wall" with Bronn actor Jerome Flynn". Digital Spy. Retrieved February 21, 2019. ↑ Jeffery, Morgan (April 3, 2018). "Joe Dempsie hints at a major role for Gendry in Game of Thrones season 8". Digital Spy. Retrieved February 21, 2019. ↑ Chase, Stephanie (October 2, 2018). "Game of Thrones season 8 has "monumental set pieces" with cast all together, says Ser Jorah actor Iain Glen". Digital Spy. Retrieved February 20, 2019. ↑ McCreesh, Louise (November 6, 2017). "The Night's Watch WILL be in Game of Thrones season 8, confirms Lord Commander actor". Digital Spy. Archived from the original on December 6, 2017. Retrieved December 18, 2017. ↑ Medeiros, Madison (August 30, 2017). "Attention Cleganebowl Fans: The Hound & The Mountain Are Already Bashing Each Other IRL". Refinery29. Archived from the original on September 2, 2017. Retrieved December 18, 2017. ↑ Riddell, Rose (May 29, 2018). "Interview: Daniel Portman on 'Game of Thrones' and his upcoming visit to New Zealand". Coup de Main. Archived from the original on June 12, 2018. Retrieved June 4, 2018. ↑ Bundel, Ani (February 18, 2019). "Edmure Tully Will Be In 'Game Of Thrones' Season 8 Episode 1, Here's What That Means". Elite Daily. Retrieved February 18, 2019. ↑ Seddon, Dan (December 6, 2018). "Game of Thrones' Night King teases HUGE season 8 battle that will be a "historic moment in television"". Digital Spy. Retrieved February 21, 2019. ↑ Stolworthy, Jacob (October 18, 2017). "Game of Thrones season 8 casting announcement debunks fan theory". The Independent. Archived from the original on November 8, 2017. Retrieved November 7, 2017. ↑ Miller, Liz Shannon (August 28, 2017). "'Game of Thrones' Season 8: Everything We Know About the Final Season". Indiewire. Archived from the original on October 20, 2017. Retrieved October 20, 2017. ↑ Morton, Ashley (March 13, 2017). "Everything You Missed From Game of Thrones at SXSW 2017". Making Game of Thrones. Archived from the original on June 6, 2017. Retrieved March 13, 2017. ↑ James Hibberd, James Hibberd (June 2, 2017). "Game of Thrones: HBO clarifies prequels, final seasons plan". Entertainment Weekly. Archived from the original on June 2, 2017. Retrieved June 4, 2017. ↑ Shepherd, Jack (October 23, 2017). "Game of Thrones season 8 filming looks to be underway as cast members spotted in Belfast". The Independent. Archived from the original on October 24, 2017. Retrieved October 24, 2017. ↑ Kelleher, Kevin (July 9, 2018). "'Game of Thrones' Final Season Has Finished Filming. Now a Winter of Waiting Begins". Fortune. Archived from the original on July 13, 2018. Retrieved July 19, 2018. 1 2 Birnbaum, Debra (April 14, 2016). "Game of Thrones Creators Mull Shorter Final Seasons". Variety. Archived from the original on August 21, 2016. Retrieved June 27, 2016. ↑ Goldberg, Lesley (April 14, 2016). "'Game of Thrones' Considering Shorter Final Seasons". The Hollywood Reporter. Archived from the original on June 18, 2016. Retrieved June 27, 2016. ↑ Hibberd, James (July 18, 2016). "Game of Thrones: HBO announces summer return, 7 episodes". Entertainment Weekly. Archived from the original on September 1, 2016. Retrieved July 18, 2016. 1 2 Hibberd, James (March 12, 2017). "Game of Thrones producers confirm final season only 6 episodes". Entertainment Weekly. Archived from the original on March 12, 2017. Retrieved March 13, 2017. ↑ Bradley, Bill (January 26, 2017). "'Game of Thrones' Composer Says You're Not Hearing What You Think You Are". The Huffington Post. Archived from the original on January 26, 2017. Retrieved March 13, 2017. ↑ Patten, Dominic (January 13, 2019). "'Game Of Thrones' Final Season Debut Date Revealed By HBO With New Tease". Deadline Hollywood. Retrieved January 14, 2019. ↑ Melas, Chloe (December 8, 2018). "'Game of Thrones' drops new trailer and it's icy". CNN. Retrieved December 8, 2018. ↑ "Game of Thrones: creepy new trailer reveals release date for final season". The Guardian. January 14, 2019. Retrieved January 14, 2019. ↑ Hahn, Jason Duaine (February 3, 2019). "Attention Game of Thrones Fans: The Bud Light Super Bowl Commercial Featured Some Must-See Cameos". People. Retrieved February 17, 2019. ↑ "The First Photos From Game of Thrones Season 8 Have Arrived and Winter Is Truly Here". Time. February 6, 2019. Retrieved February 8, 2019.